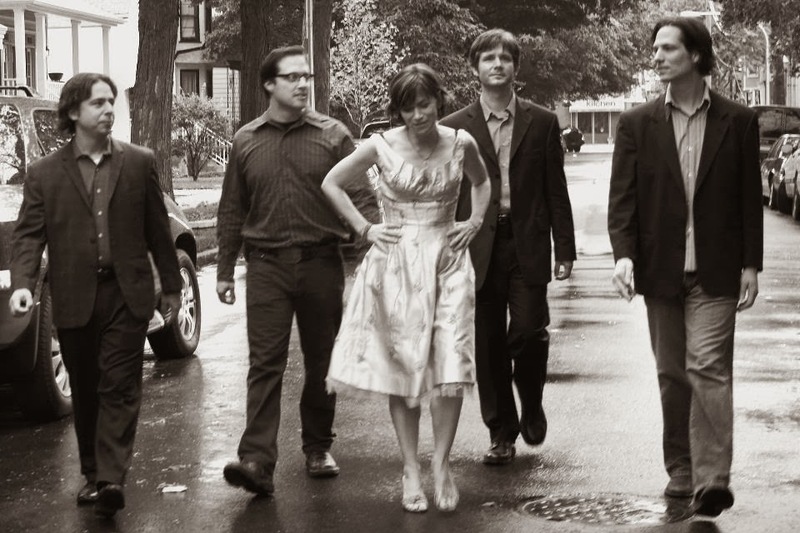 The Handcuffs will be headlining a triple bill at the 27 Live club in Evanston tomorrow night. The fun and catchy punk rockers Swimsuit Addition and The Queue, who were moving away from their original British Invasion approach when I saw the at International Pop Overthrow - Chicago a while back, are the other two acts on the bill. The show starts at 9:00 PM. You too can help fight AIDS. I often come away from watching the Super Bowl with a feeling that the endlessly hyped TV ads weren’t as clever or imaginative as I was led to expect. It’s not as disappointing as when the Bears lost to the Colts in 2007, but it is a letdown. This year, there’s one ad I’m sure will make me happy. U2, in conjunction with (RED), the international charitable organization, is doing a spot to help fight AIDS. 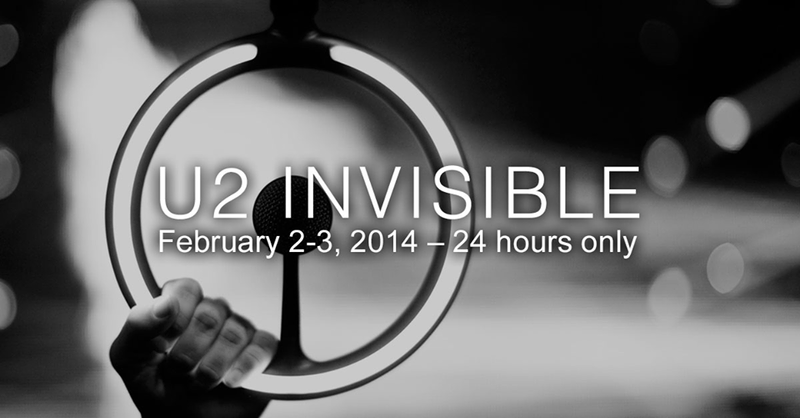 Fans can join in by downloading the band’s new song “Invisible” for free on iTunes on February 2nd -3rd. Bank Of America will donate $1 (up to $2,000,000) for each download to help (RED)’s quest to end AIDS. The second annual Danstock Benefit Showcase to Raise Funds for Melanoma Research at the Robert H. Lurie Comprehensive Cancer Center of Northwest University of Northwestern University takes place next Thursday, February 6th at Lincoln Hall. Band Called Catch, American Wolf, Sabers, and DeXter, will be performing. 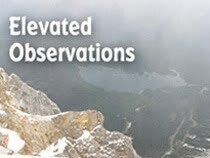 Admission is $20, and there are VIP tickets available for $100.00. Singer Lisa Rock will bring her tribute show Close To You: The Music of the Carpenters to Cutting Hall in Palatine on February 19th. Tickets are $30; the 90-minute music starts at 7:30 PM. People looking to have an early dinner before the show can go to the nearby Gianni’s Cafe and get 10% off their bill by mentioning Close To You. Maybe more of this sort of entertainment venue/restaurant cross pollination could increase the number of visitors to Palatine. Chicago-based psychedelic rock band Secret Colours has released a second single from its upcoming EP Positive Distractions Part 1. You can find the guitar-driven “City Slicker” on SoundCloud and the Impose website. 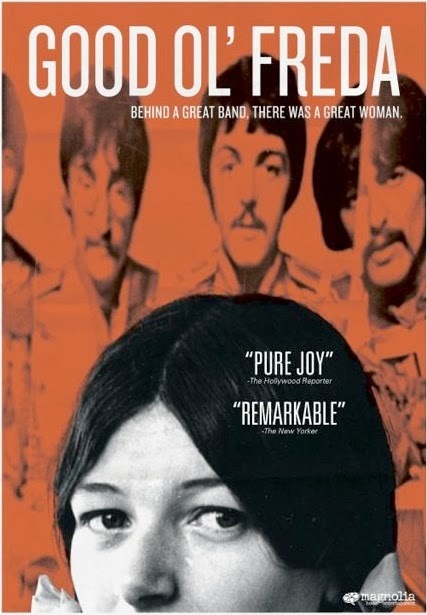 On February 9th, the Rock And Roll Hall of Fame in Cleveland will be celebrating the 50th Anniversary of The Beatles coming to America with Gallery Talks in its Beatles exhibit; screening of the CNN series The Sixties: The British Invasion and The Beatles: The First U.S. Visit in its Foster Theater. The Museum will also display the Rickenbacker guitar John Lennon played on The Ed Sullivan Show in 1964. They’ll also be twisting and shouting about that Beatles Anniversary in Louisville, where 12 cover bands will take part in Abbey Road On The River. Britbeat, The Jukebox, The Rigbys, Nervous Melvin, The Cryers, and Traveling Beatleburys will be some of the bands playing at The February ‘64 Celebration on the weekend of February 7- 9. After recording two full CDs and a few singles, the French trio (formerly a quartet) Plastiscines will release Black XS, a 5-song EP of rock covers on February 3rd. Lana Del Rey, Air, and Wham are among the artists getting the Plastiscines treatment. Mary-Arrchie Theatre kicks off season number 28 on February 4th with the Marilyn Campbell and Curt Columbus adaptation of Dostoyevsky’s Crime And Punishment. Rich Cotovsky directs the three-person cast of Jack McCabe, Ed Porter, and Maureen Yasko. The play runs through March 16th. There’s a record release party for People’s Temple’s Musical Garden (LP/CD) and Radar Eyes “Positive Feedback” 7” single release next Thursday at Bottom Lounge in Chicago. 10:00 PM. Special guest Outer Minds are also performing. 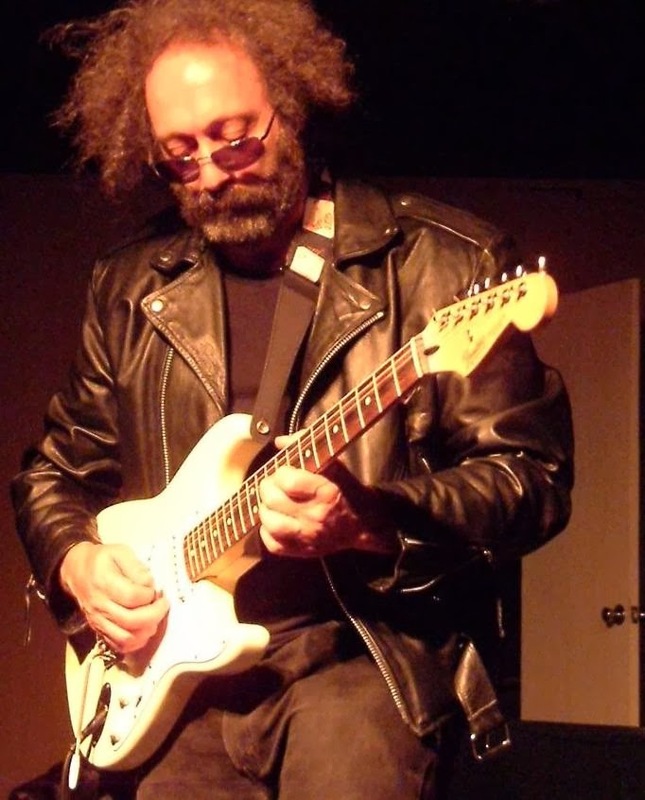 Ellis Clark and Phil Angotti have both had long careers as solo artists and with various bands. They’ve been joining forces on gigs lately, and they’ve recorded a version of The Beatles’ “I Dig A Pony” that can be heard on Breakfast With The Beatles with Terri Hemmert this Sunday morning on WXRT. 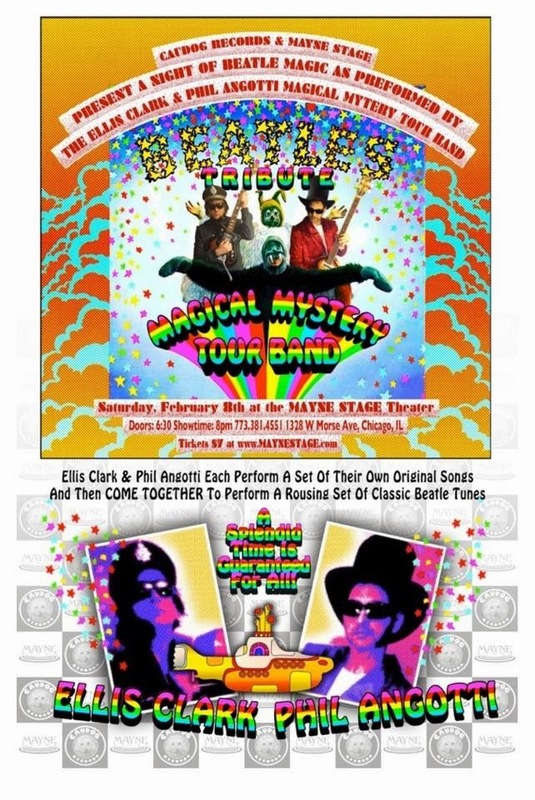 The duo will be doing a Beatle tribute show at Mayne Stage in Chicago next Saturday, February 8th. Also at Mayne Stage, Badfinger with Joey Molland has a gig on March 2nd. 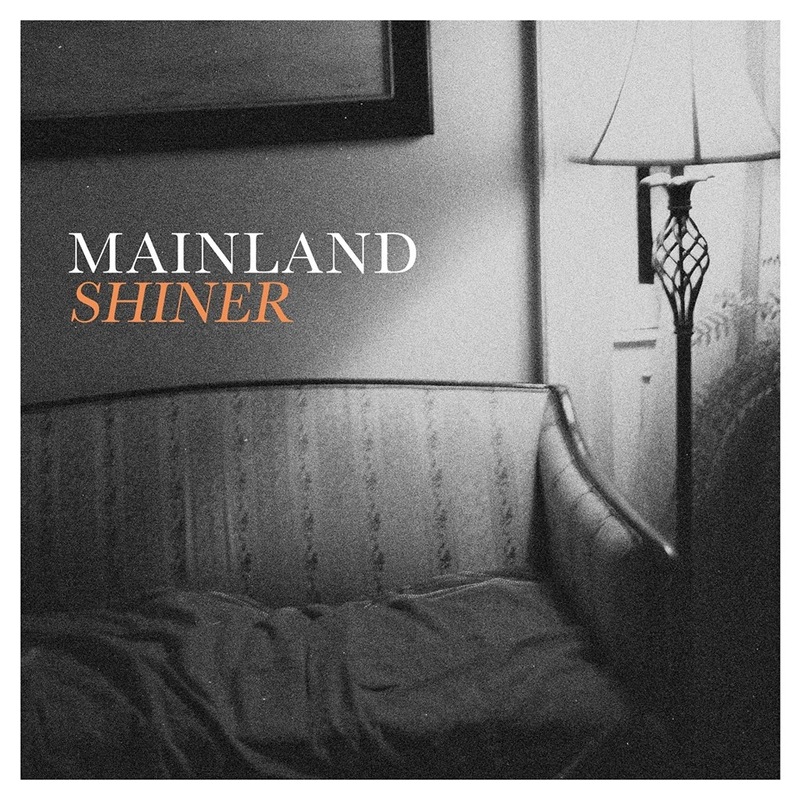 “Savant,” the opening track on Mainland’s new Shiner EP, grabs the listener by both hands and then takes off running. The high-speed guitars and brash vocals call to mind the original punk era of the late 1970s. It’s a coming of age song, delivered from a New York-based quartet that doesn’t look all that old. Lead vocalist-guitarist Jordan Topf’s voice is perfectly suited for this approach, evoking Supergrass on the title track, which offers another take on growing up. “When I was younger, I would do all the things you like,” Topf notes. “Now I’m older and this feeling isn’t right.” Bassist Alex Pitta provides a strong but playful rhythm, whereas on other songs, he keeps pace with the energetic strumming of Topf and guitarist Corey Mullee. “Heaven” has a slower, more classic rock feel, as Topf, Pitta, Mullee, and drummer Dylan Longstreet combine for a well-crafted arrangement. “Leave The Lights On” could be the song that garners the most attention for Mainland. With its shimmering guitars, rampaging rhythm section, and Topf’s evocative singing, it would have fit in perfectly on U2’s Boy album. Wonder if they’ll do any Dum Human Tricks. Photo from The Dum Dum Girls Facebook page. A couple of things going on this week. The Dum Dum Girls, who released their latest CD, Too True yesterday, will be performing on The Late Show With David Letterman tomorrow (Thursday) night. The band, led by singer-guitarist Dee Dee Penny, kicks off its American tour at the Backstage Bar in Las Vegas on March 8th, and will be appearing at the Coachella Festival in April. The Dum Dum Girls have a gig scheduled at The Empty Bottle in Chicago on March 31st. Writer/performer/filmmaker Lance Eliot Adams and director Eugene S. Park are hosting a Wrap Party Open House for their short film Self-Deportation from 6:00 to 10:00 PM this Friday night at Space 1858. Self-Deportation, which was directed by Park and co-produced by Adams and Cynthia Bond, is the tale of an Asian-American reacting to racism in American society. The event will allow visitors to interact with sets Park and Brittney Williams designed for the film, and watch cast members reenact scenes. Music will be provided by Ho Etsu Taiko, and there will be beer, wine, snacks. Space 1858 is located at 1858 W. Grand in Chicago. Last Sunday morning, while cooking eggs and occasionally peeking out the kitchen window to watch birds eating from their newly stocked feeders, I listened to Terri Hemmert’s Breakfast With The Beatles show on WXRT. She mentioned a tribute to George Harrison’s All Things Must Pass album coming up this Thursday. Professor Moptop, who contributes an informative study of a different Beatles song to her show each week, is going to be there, offering what he calls ‘tea and sympathy.’ At a time when there are so many events going on to celebrate the 50th Anniversary of The Beatles first coming to America (not that I’m complaining), it’s nice to see George get an appreciative nod for his solo work. 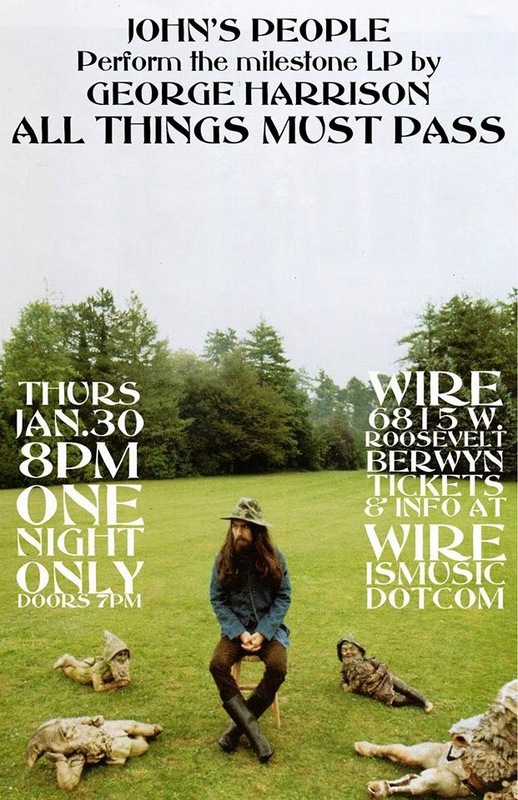 John’s People, a self-described “high concept garage band,” will recreate the entire three-record set on Thursday at the Wire rock club in Berwyn. A collection of 12 musicians, led by guitarist-vocalist John San Juan, will be on hand to make sure All Things Must Pass passes muster. They come from the bands Plush, Chamber Strings, Hushdrops, Expo ‘76, and Veruca Salt, so this definitely looks promising. Tickets are $10, and the tribute music starts at 8:00PM. John’s People, which apparently has a rotating membership, has previously tackled Pink Floyd’s Piper At The Gates Of Dawn and Neil Young’s Tonight’s The Night. The Revo Lution Theatre Company’s Staged Reading Series will present Kevin Wiczer’s Deranged Inhabitants tomorrow night at the Burton Place Bar and Grill at 1447 N. Wells Street in Chicago. Steve Carter Ruppel directs cast members Jonatham Coffin, Erin Heidt Makowski, Jeff Botelhos, Iena Arkelious, and Kevin Higginbotham in this tale of a man who lives within the walls of his home until an Avon Lady comes calling. The show starts at 6:00 PM. Sci-fi rockers Tomorrow The Moon, featuring Bad Examples guitarist Steve Gerlach, are among the four bands performing next Thursday, January 30th at The Beat Kitchen on Chicago’s north side. Check out this artful and eye-popping video for “He Saw Red.” Frosting, who like Tomorrow The Moon have had two CDs favorably reviewed here on BHT, are also on the bill, along with The Dead Woods and Katasstrofist. The music starts at 8:00 PM. Singer-guitarist Jeff Lescher from the critically acclaimed power pop band Green is inviting about 40 fans to join him in his living room for a solo show in early February. Lescher lives in Milwaukee. Take A Walk On The Charitable Side. 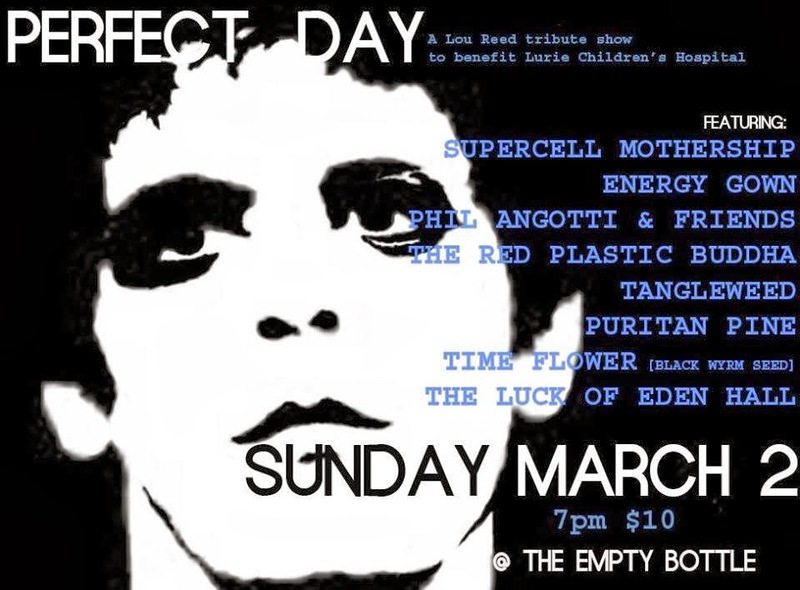 The Empty Bottle in Chicago will be the scene of Perfect Day, a Lou Reed tribute show to benefit Lurie’s Children’s Hospital, on Sunday, March 2nd. The participating bands are Supercell Mothership, Energy Gown, Phil Angotti And Friends, The Red Plastic Buddha, Tangleweed, Puritan Pine, Time Flower, and The Luck Of Eden Hall. Tickets are $10, and the tribute kicks off at 7:00 PM. And in other Luck Of Eden Hall news: Butterfly Revolutions Volume 1 and 2, both of which did well on the Broken Hearted Toy 2011 and 2012 Favorite Releases lists respectively, are now available as a double LP on 180 gram colored vinyl. If you’ve heard this band’s authentic take on 1960s mind-bending psychedelic rock, you’ll agree it makes sense to create a Butterfly Revolutions Volume 1 and 2 vinyl set. It can be ordered at Norman Records, Clear Spot and other sites. Fruits de Mer, the U.K. all-vinyl indie label that released the fantastic Hollies tribute album, Re-Evolution, made an intriguing announcement on Facebook recently. It’s considering an American multi-act tour called Crabstock USA The Fruits de Mer Records Festival of Psychedelia. Hopefully, more details will be released soon. As a collector of pop culture memorabilia, I’ve often wondered why female action figures are rendered far less realistically than their male counterparts. A recent post on the Doctor Who Facebook page displaying a new line of figures from the sci-fi series, revealed I’m not the only one who feels this way. The funniest comments regarded the Clara Oswald figure, which in no way resembles Jenna Coleman, the enchanting actress who portrays her. “Those are some of the worst figures I have ever seen,” read one comment. Here are a few other observations: “Clara looks like a potato.” “Wow, they managed to make Clara ugly.” “Uh, why does the Clara figurine have MOFFAT’S FACE?” Writer/producer Steven Moffat occasionally gets flack for the changes he’s brought to Doctor Who, but I don’t think he’s responsible for these action figures. In a year already overflowing with tributes to The Beatles, here’s another worthy entry. 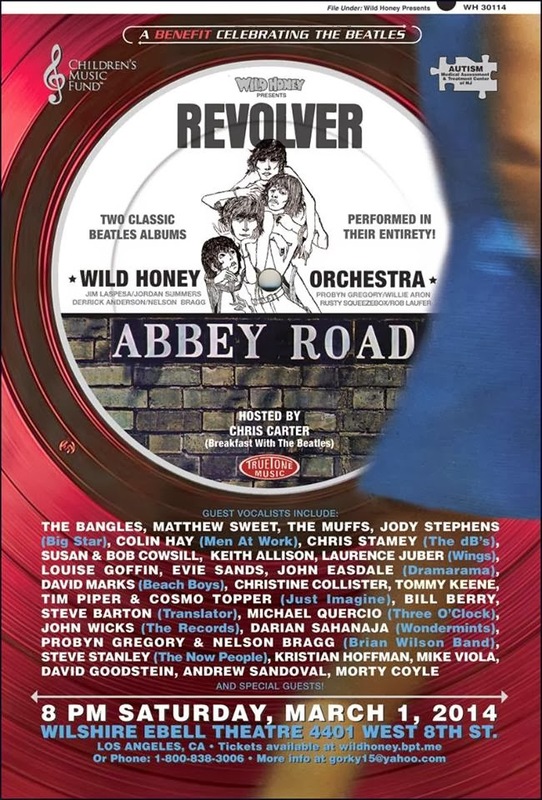 If I lived in Los Angeles, I know I would be at the Wilshire Ebell Theater on Saturday, March 1st for Wild Honey Presents: The Beatles’ Revolver & Abbey Road to Benefit the Autism Think Tank and the Children’s Music Fund. The Wild Honey Orchestra is comprised of drummer Jim Laspesa; bassist Derrick Anderson; guitarists Rob Laufer, Rusty Squeezebox, and Andrew Sandoval; keyboards players Darian Sahanaja and Willie Aron; percussionist Nelson Bragg; horn players Probyn Gregory and Sarah Kramer; trumpet player Dan Clucas; sax players Paul Pate and Seung Park; and trombone player Masha Petrowizky. Power pop fans will no doubt recognize some familiar names among those players, and Wild Honey has lined up an impressive collection of guest vocalists to help recreate the two Beatles LPs. You might even call them Broken Hearted Toy all-stars if this blog was involved with the show. The list includes The Bangles; Jody Stephens of Big Star; Matthew Sweet; Chris Stamey of The dB’s; guitarist Laurence Juber, formerly with Wings; Colin Hay from Men at Work; The Muffs; Evie Sands; Susan Cowsill, who recently completed a CD with Bangle Vicki Peterson as The Psycho Sisters, and Bob Cowsill; Louise Goffin; David Marks from The Beach Boys; Keith Allison; Tim Piper and Cosmo Topper from Just Imagine; Christine Collister; John Wicks from The Records, and a new project he’s working on with Bangle Debbi Peterson; Tommy Keene; Michael Quercio of The Three O’Clock; Steve Barton of Translator; Andrew Sandoval; Mike Viola; John Easdale of Dramarama; Steve Stanley; Bill Berry from R.E.M. ; Kristian Hoffman; and Morty Coyle. Ticket prices range from $25 to $100, which is certainly reasonable considering the talent involved. Plus, the money is going toward two worthy causes, the Autism Think Tank and the Children's Music Fund. Ready for her moment in the limelight. Photo from Dolly Varden’s Facebook page. Here are a few things going on tomorrow night in the Chicago area. When Dolly Varden performs as part of a double bill tomorrow night at FitzGerald’s in Berwyn, there will be something about the show that even long-time fans haven’t seen before. The alt rock/Country and Western band has always been known for the exquisite harmonies of vocalist-guitarist Steve Dawson and his wife, singer-guitarist Diane Christiansen. Tomorrow, Christiansen will get extended time front and center. “We’ve talked about doing a show like this for a long time,” Dawson notes on the Dolly Varden website. Some of the songs she’ll sing lead on will be her own compositions, while others will be ones penned by Dawson. “We’re going to stack a bunch of them together and give Diane the spotlight.” Dawson promises he’ll be doing his share of lead vocals too, and he plans to join singer-guitarist Phil Angotti (the other half of the double bill) for a few tunes between the sets. In addition to performing with Dolly Varden, Diane Christiansen is an artist who frequently exhibits her work at events in the Chicago area. A fourth band has been added to tomorrow’s American/indie rock lineup at Reggie’s in the south Loop. The schedule is now as follows: The Abbeys at 8:00 PM; Jukebox Casanova at 9:00 PM; The Harmaleighs at 10:00 PM; and The Papers at 11:00 PM. Mike Cohen of The Abbeys promises he’ll have copies of the band’s Please File Under: Twang for sale. That’s the CD that came in at Number 17 on the Broken Hearted Toy Favorite Releases Of 2013 list. Although I never sported a hairstyle inspired by A Flock Of Seagulls or wore outfits like the guys in Duran Duran, I immediately embraced New Wave music and have liked it ever since. It was easy to feel at least a certain amount of alternative cred browsing through rows of 45 records at Wax Trax! on Lincoln Avenue. The store also had a good selection of magazines and newspapers from around the U.S. and England. The London-based publication The Face, which presumably took its name from Mod slang for a cool trendsetter, covered cutting-edge music, film, fashion, and politics. The front cover of this April, 1982 issue featured the U.K. ska band Fun Boy Three working out at a gym, along with a member of Bananarama. The two acts had recently joined forces for an enticing and rhythmic take on the 1960s song “Really Saying Something” by the Velvelettes. Publisher/Editor Nick Logan and designer Neville Brody favored a mostly black and white look for The Face’s graphics, with occasional full-color photos. This issue cast a spotlight on African and Bolshevik fashions, and there was an article about collecting vintage toys. Political columnist Julie Burchill, who judging from the Letters column, was no stranger to controversy, traveled back to The House Committee On Un-American Activities battle with Hollywood’s elite. 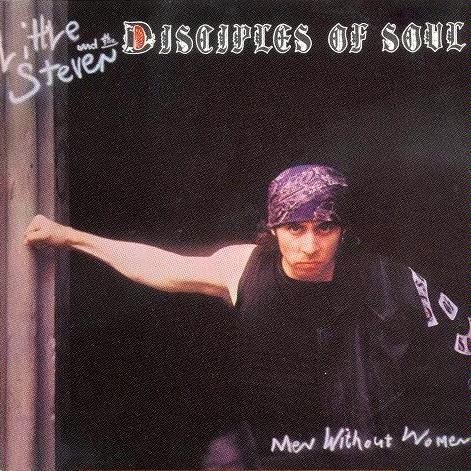 Long before Little Steven Van Zandt began hosting Underground Garage, the world’s coolest syndicated radio show or captured cable TV viewers’ hearts as Silvio Dante on The Sopranos, he recorded the single “Forever” with The Disciples Of Soul. It’s from the LP Men Without Women. I’m pretty sure I saw the video for this song before I heard it on the radio. It mixes images of Van Zandt and his band performing onstage with footage of him tooling around the big city dressed in his biker chic. All I know for sure is that I bought the 45 back in 1982 and immediately included it on one of my mixed tapes. After an emotionally charged departure from The Hollies, Graham Nash found his new band mates more receptive to the ambitious direction he wanted to pursue with his music. But in David Crosby and Stephen Stills, he had aligned himself with two of rock and roll’s more volatile personalities. After Neil Young was added to the mix, the chances of a recording session or live performance going off the rails became even greater. Nash writes about a time when he attempted to restore peace during the recording of the Deja Vu album, and wound up weeping instead. 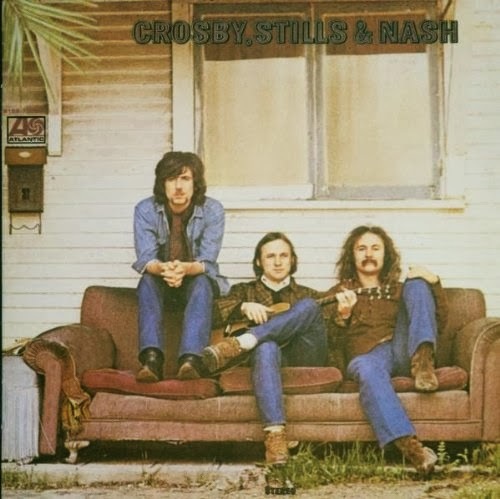 It’s common knowledge that Crosby, Stills, Nash and Young had their quarrels, but some of the incidents (and downright sabotage) Nash describes makes it hard to conceive of how these guys could go on working together. Plus, Crosby’s hellish descent into cocaine addiction left the entire band vulnerable musically and legally. Throughout Wild Tales, Nash emphasizes his passion for creating music, so we believe him when says the bond he felt with Crosby, Stills, and Young (he offers examples of each of their incredible talent and inventiveness) was strong enough to help weather the persistent storms. An early agreement that each member would be free to pursue solo and side projects also no doubt helped ease the tension. Nash has been quoted as saying a similar arrangement probably would have saved The Beatles. Recent years have seen Crosby, Stills, Nash and Young overcome their competing egos on stage; Crosby clean up his act; and Nash reaffirm his friendship with Allan Clarke of The Hollies. Nash also has a successful career in photography and treasures spending time with his wife and family. After all the Wild Tales, he’s probably thrilled to find things running so smoothly. 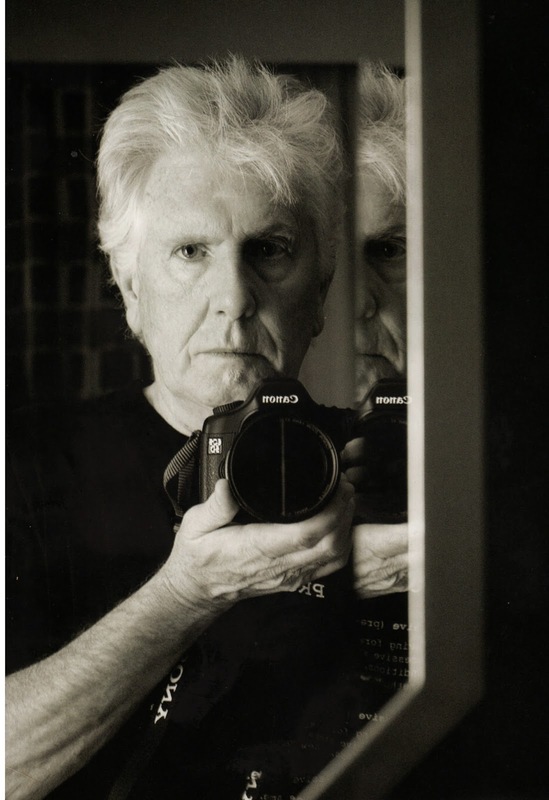 One of the many lasting images Graham Nash creates in his autobiography Wild Tales is of him singing with his father as the two of them walk together through their blighted Salford neighborhood in England. Even at that young age, he was fascinated with creating harmonies. It was a gift that would serve Nash well in making friends, particularly a classmate named Allan Clarke. Once the two lads discovered how well their voices blended together, they started performing at pubs and social functions. They were amazed the first time they heard an Everly Brothers song, and immediately decided to model their singing after those exquisite Phil and Don harmonies. Later, when Nash and Clarke formed The Hollies, they would establish a vocal sound that would help land them in the Rock And Roll Hall Of Fame by including guitarist-vocalist Tony Hicks. Hollies fans who’ve always felt the band has been short-changed in the media will find a lot to like in Wild Tales. In addition to honoring his lifelong bond to Clarke, Nash praises Hicks and drummer Bobby Elliott as first-rate musicians. He credits Hicks with coming up with the banjo riff on “Stop Stop Stop” that, “imitated a balalaika and gave the record its inimitable sound. He’d done the same magic for ‘Look Through Any Window’ and ‘Bus Stop’ with those incredible guitar riffs at the beginning of each.” By the mid-1960s, The Hollies were intent on not only writing all their own music, but to move beyond the standard boy-meets-girl love songs. Eventually though, Nash felt that he and The Hollies were no longer on the same page, creatively or in terms of social and political awareness. After his ambitious “King Midas In Reverse” failed to chart as well as hoped, he sensed that the other band members no longer trusted his instincts. They rejected “Marrakesh Express” and other songs he brought in for consideration. This was right around the time he met David Crosby and Stephen Stills in the U.S., who would soon steal him away for a new band they were putting together. 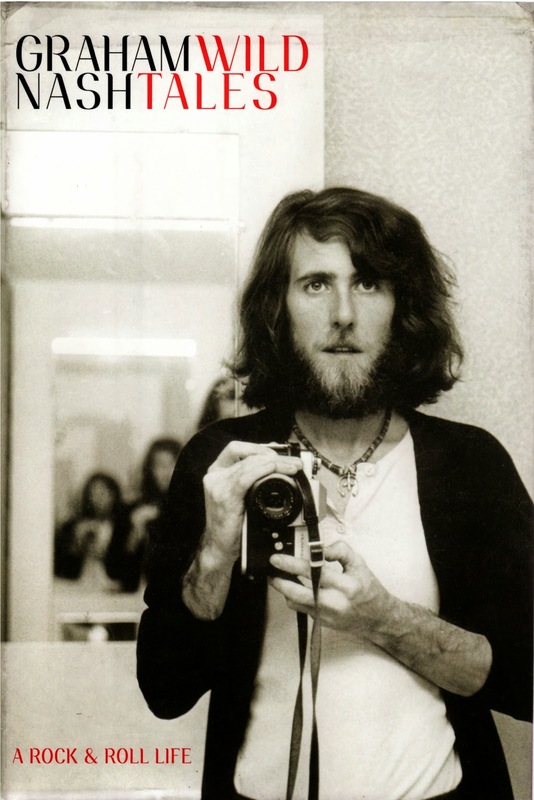 In Wild Tales, Graham Nash doesn’t waste time in getting to the big bang event most readers will be eager to hear about: His first encounter with David Crosby and Stephen Stills. After that opening chapter, Nash travels back to his childhood to begin this entertaining autobiography. It’s not a journey delivered in strict chronological order; he sometimes follows a narrative thread over the course of a few years before slipping back again to pick up another tale. Nash employs an easy-going writing style that places the reader on a bar stool beside him, most likely in an English pub. It’s a buddy-to-buddy account, with a fair amount of nudge-nudge, wink-wink material. Nash must have known that at least some of his recollections would cast him in an unfavorable light. After all, he spent a good portion of his musical career chasing mini-skirts and consuming (although never becoming addicted to) illegal drugs. He doesn’t excuse or condemn this past behavior; Wild Tales is filled with let-the-chips-fall-where-they-may observations of an era of free love and mind-altering experimentation. As he simply states in the Acknowledgments, “This is how I remember it.” Later in the book, he notes the disastrous effect that too much cocaine use had on the ability of Crosby, Stills and Nash to record or perform music. He also settles down with Susan Sennett, who becomes the love of his life. Throughout Wild Tales, Nash’s core values come across loud and clear; his obsession with harmony singing, his devotion to friends, his strong bond with his parents, and a passion for social justice. Like George Harrison and John Lennon, he became one of the pioneers of using music to reach out to others in need, whether it be in the form of writing a new song, or putting together benefit concerts. It’s been a hectic week, so unfortunately, there’s not much in the Slumgullion pot this time around. First, best wishes to singer-guitarist Vicki Peterson of The Bangles on her 25th birthday. 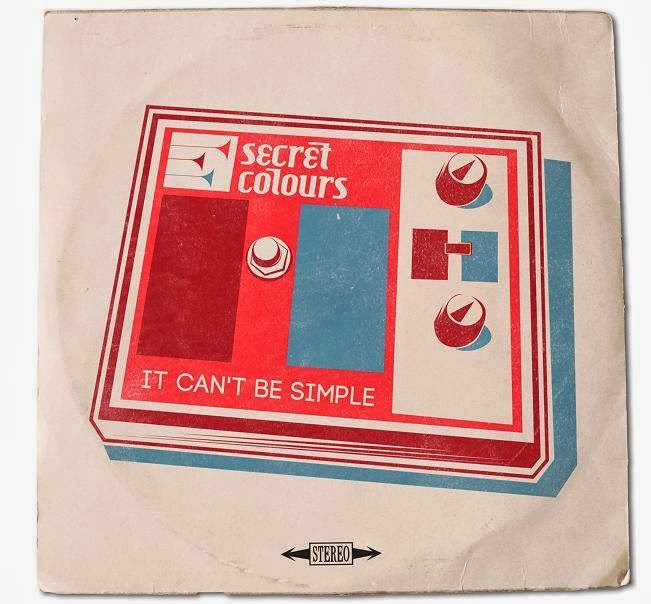 Chicago-based psychedelic rockers Secret Colours have two EPs coming out in the first half of 2014: The digital release of Positive Distractions Part I will be on February 4th, and Part II will be digitally released on April 29th. Both parts will be available on the same slab of vinyl on April 29th. Secret Colours have created a fun retro-tech video for “It Can’t Be Simple,” one of the songs from Positive Distractions Part I.
WXRT air personality Richard Milne will present The Anesthetic Best of ’13 on the station this Sunday night from 7:00 to 8:00PM. Milne has been doing Local Anesthetic for several years, and it’s a great way to keep up with the latest bands in Chicago. It’s All-Right To Have A Good Time - The Story Of Curtis Mayfield has been extended through March 30th at the Black Ensemble Theater on Chicago’s north side. The critically acclaimed musical bio is now running along side Chicago’s Golden Soul, which also features the music of Mayfield, along with Jerry Butler, Gene Chandler, Tyrone Davis, and other R & B stars who came up through the Windy City. If I could carry a tune, I’d go there and sing “Paperback Writer.” As noted in Thursday’s Chicago Sun-Times, The Harold Washington Library has a 50th anniversary of The Beatles coming to America karaoke bash scheduled for 12:15 on Friday, January 24th. The library is located at 400 S. State. People interested in taking part can call 312-747-4850 for more information. I just finished reading Graham Nash’s autobiography Wild Tales. While he understandably spends the majority of his time spinning tales of his days with David Crosby and Stephen Stills, there’s a wealth of inside information and anecdotes to please an avid Hollies fan like myself. Reading Nash’s recollections of those early days with The Hollies took me back to the Christmas of 1966, when I received the Hear! Here! LP as an added bonus to the “Stop Stop Stop” single I had asked for from one of my older brothers. The joy of discovering those ringing guitars and spirited harmonies would stick with me for a lifetime. Even more impressive was that Nash, lead vocalist Allan Clarke, and guitarist Tony Hicks had begun to compose their own material. Rollicking songs like “Put Yourself In My Place,” “When I Come Home To You,” and “I’ve Been Wrong” (later recorded by The Everly Brothers), along with the melancholy ballad “So Lonely,” clearly indicated that The Hollies were well on their way to becoming one of the British Invasion’s most influential acts. I’m hoping to post a review of Wild Tales here on Broken Hearted Toy some time next week.